Spring quarter is coming to a close, and for many of us, that means saying a bittersweet goodbye to books that have carried us through the academic year. For faculty and graduate students, all books and materials checked out from Northwestern Libraries are due on May 31, but eligible materials can be renewed for another year. 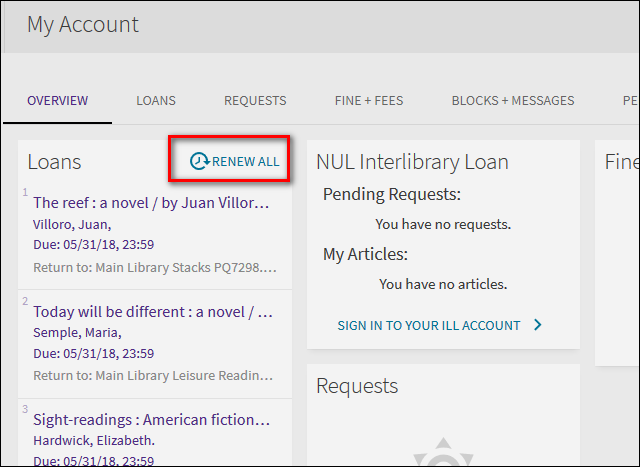 If you’re not ready to part with your library books, login to your account to renew all of your Northwestern materials at once. Interlibrary loans and recalled books will not be renewed. Questions? Ask us: 847-491-4658 or email circulation@northwestern.edu.